When it comes to public speaking whether in a large gathering or in a small one, that always reminds me of Steve Jobs, the master presenter. His presentation left the media salivating over his every word and customers flock to Apple stores and wait in line for days to be the first to buy the newly released product. You may not have that huge fan base but you can still use the strategies that Jobs employed. 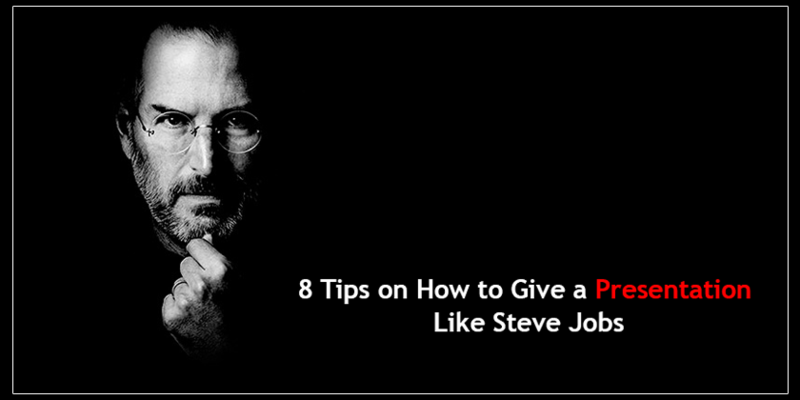 Here in this article, we will tell you about 8 tips on how to give a presentation like Steve Jobs and some of his presenting style secrets. Hit your audience with a headline. Because this is a quite clear, concise theme that should run through your talk. In addition, your heading should be short enough to be memorable and tweetable. When he presented the iPhone, he only had used 52 characters long headline. That was short enough and perfect too, to memorize and tweet. If you can describe the custom as emotions, that is more like a story which is much more engaging for your audience. The man has been telling stories because it works and Steve Jobs too. He arranges his talks like a story to make his audience involve in. Simplify your big numbers so that people can understand them better. 2 mMillion iPods that are a big number. But Steve Jobs simplified the number as ” That is nearly 34,000 iPods sold every day”. Steve Jobs always used big, bold and clear images. He almost never used more than two images on a presentation slide. At the 2007 launch of the iPhone, he used three images but that was to highlight that iPhone could do all the things of music player, phone and internet access. Then, he moved to his normal procedure of one striking image. The tiny text does not mean small texts unable to be seen. That means to reduce and edit your text to only essential words that clearly communicate no message. Nobody wants to see lines or boring texts. At the iPhone launch, Steve edited his texts as works like magic, no stylus, far more accurate and etc. edit your text to the smallest amount possible. It looks so much power and allows the audience to hear, focus on and to understand the key messages. As you know that smile is one of the most powerful weapons. So if you send out a smile, it definitely comes back to you. If you physically engage with your audience, you will also engage them mentally. If you look like having fun, your audience will too have fun. Steve Jobs always used to smile during his speeches that made him more effective. As well as showing enthusiasm with exaggerated body language. Steve Jobs showed massive enthusiasm with the language he used ‘fantastic, amazing, incredible, extraordinary. When you are excited, it is difficult for your audience to resist. In your presentation, you should have one magic moment that could build up your climax and put on a show and amaze your audience. As Steve Jobs took out the shiny and beautiful Mac book air from an ordinary covering and smiled again. That was Truly a magical moment that is difficult to forget. Even if you can present like Steve Jobs, in a long presentation, your listeners might lose focus for a moment here or there. So it is incredibly important to have informative transitions that tell your audience what you are going to talk about and then just after summarize the important information that you want them to remember. So, before you continue your speech, don’t loose the key information.